Summer in Tuscany is spent soaking up the sun at the beach or escaping the heat in the mountains; as olive farmers, our autumn is dominated by the raccolta(harvest). Come winter, the olives picked and pressed, and the towns and cities a little less crowded with tourists, our minds turn to more cultural pursuits. With Florence on our doorstep, complacency is easy, but a visit to the Galleria degli Uffizi, its rooms overflowing with Rinascimento treasures, is a reminder of our fortuitous location. One of the privileges of living close to Florence to is that you don’t need to gorge on its beauty. Taking things slowly, each visit brings new observations, surprises and pleasures. As we walk through the gallery my thoughts turn, as they often do, to my next meal, and I indulge in a little food spotting. Apples and Last Suppers feature heavily, as you might expect in a gallery full of religious art, but also abundant are pomegranates, fat and globular, their skins split and bursting with scarlet seeds. Once you start looking out for it you realise that the pomegranate (melograno or sometimes melagrana in Italian) is a common motif in Renaissance paintings and tapestries. Commonly clasped by the Madonna and/or child, the pomegranate is part of the rich visual language of early Renaissance art, containing layers of meaning as densely packed as its ruby-red arils. 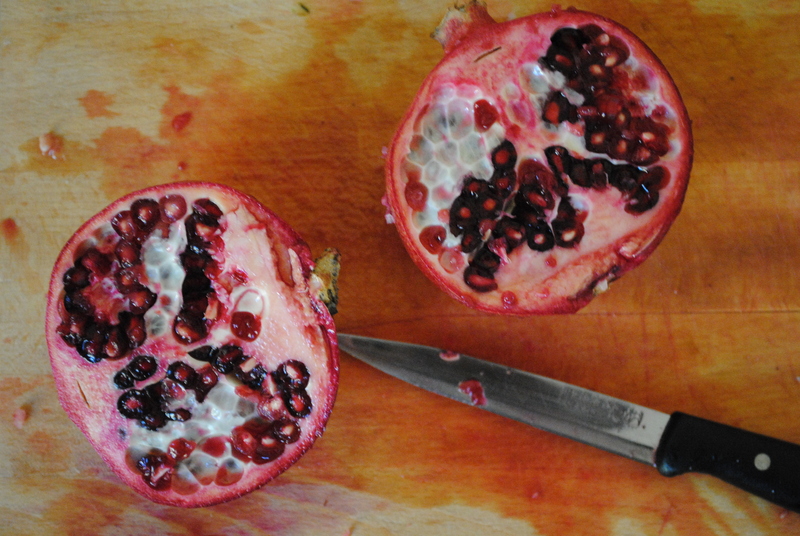 Some of its symbolism is obvious: the crimson-splattered state of my kitchen after I’ve been eating or preparing the fruit conjures up an immediate connection with blood, sacrifice, and thus the Passion, and the fruit’s ‘crown’ suggests a link with royalty. Other connotations are more esoteric: a single fruit contains multiple seeds, or arils, and the pomegranate is thus seen as representing the diversity and unity of the Christian congregation. Proffered by the Madonna, it represents her gifts to mankind; packed with seeds, it is a symbol of female fecundity. Sandro Botticelli, Madonna del Magnificat,1483. Galleria degli Uffizi, Firenze. 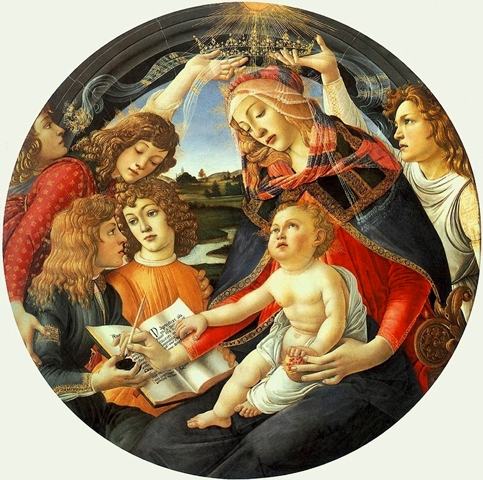 The pomegranate may also allude to Greek mythology (a connection which cannot be discounted in the case of Botticelli, whose Birth of Venus and Primavera, commissioned by the Medici family, reference classical mythology and reflect the humanist ideals and interests of Lorenzo di Medici’s court). According to Greek mythology, the pomegranate tree first sprang from the blood of Dionysus (the god of wine and ecstasy) when he was killed by the Titans; he was later resurrected by his grandmother. The fruit is also associated with Persephone, who was condemned to spend half of every year in the underworld after she was tricked by Hades into consuming a handful of pomegranate seeds. Her mother Demeter, the goddess of fertility and the harvest, went into mourning each year until Persephone reemerged from the underworld, and the pomegranate is thus associated with fertility, abundance, and springtime. The figures of Dionysus and Persephone and their stories of death and rebirth have clear parallels with the resurrection in Christianity. Inspired by Botticelli’s magnificent tondi (round paintings), we stop on the way home to pick up a couple of pomegranates. Currently in season, they are heaped high at market stalls and hanging from trees like baubles. Pomegranates have been cultivated and eaten in Italy since Roman times, when they were brought to the ‘boot’ from Carthage. Pomegranate trees, heavy with swollen, scarred fruit, are a common sight in Tuscany, but Italian pomegranate recipes tend to hail from the south – Sicily, Puglia, Calabria, Campania – where their cultivation is more widespread. There are various methods for extracting pomegranate seeds cleanly, but for me part of the pleasure is the juicy, messy, stickiness of it all. There’s a glorious opulence about a juice-splashed kitchen and scarlet-stained fingers that more clinical extraction methods lack. If, however, you don’t want your kitchen to look like a crime scene, try holding and cutting the fruit under water, or slice off the top, score the sides and de-seed it in neat sections. 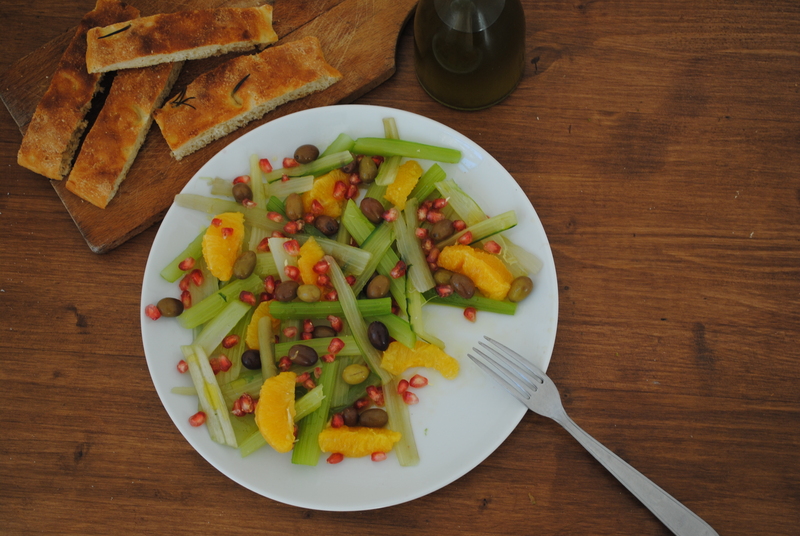 This particular salad, full of colour and contrast, was suggested by a Sicilian friend: sweet-sharp pomegranate arils, slivers of sun-drenched orange, bitter celery and puntarelle/chicory, the saltiness of olives and a generous amount of the best, freshest olive oil you can find. We eat it with grilled or roast meat and toasted focaccia to ensure dinner remains a warming experience. Technically, it’s too early for this salad, being as it is, di Natale (of Christmas), but since the temperature is already frosty and the days short, we succumb early: the bejeweled platter brightens up our evening. As if we needed another excuse, a crisp winter salad is a good alternative to a hearty soup for showcasing the fruitiness of our olio nuovo (the new olive oil of the year). Wash the celery and puntarelle/chicory thoroughly. Slice into short strips. Boil in salted water for a 3 minutes. Drain and cool. Slice the top and bottom off each orange so they sit flat on the chopping board. Pare the orange, taking care to remove the bitter white pith along with the peel. Slice the orange along the divisions of the segments, so you are left with skinless segments. Extract the arils from the pomegranate, removing any pieces of white pith. 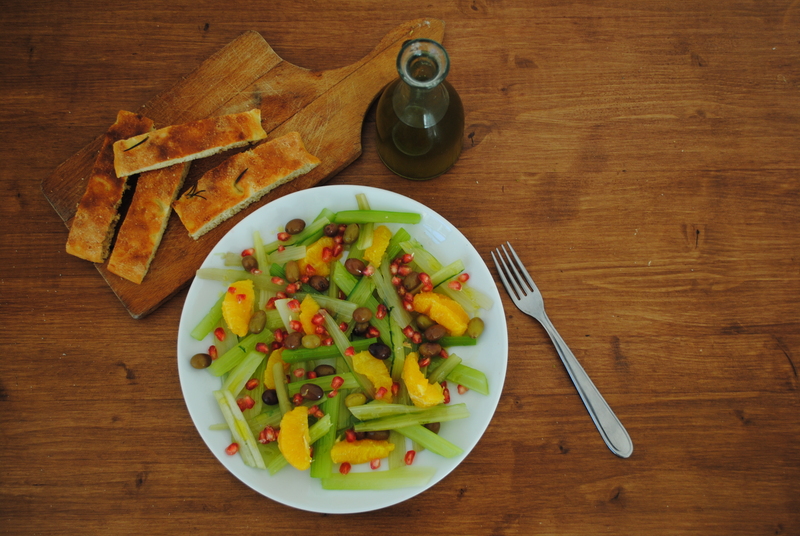 Arrange the chicory, celery and orange on the plate or serving dish and scatter over the pomegranate arils and olives. Drizzle generously with olive oil and season with plenty of salt. Absolutely stunning images, words and deed. I invite you to visit my humble blog here in the US. Cheers! About topop by now… thanks for visiting us. Your salad looks very colourful and delicious. I made a poached turkey and pomegranate salad one Christmas and it was wonderful. They also go well in an avocado dip! Good to see you enjoying the delights of Florence a little at a time, just the way I like it too. That sounds yummy. We’re making pomegranate liqueur at the moment, I have high hopes for that too! Florence is so full of wonderful things, it’s a real priviledge to be able to absorb it all slowly. I like the sound of pomegranate liqueur!! I love pomegranates! They look so wonderful hanging on the trees…and taste great. I will certainly try your salad, thank you. It’s a borrowed recipe not my own, but good – I think pomegranate goes well with any bitter, slightly crunchy veg – radicchio, chicory, fennel… I love pomegranate trees too, I wish we had the space for one. I currently have three HUGE pomegranates sitting in a glass bowl on my dining room table. Tonight one of them gets cut open. Lucky you! Eat as many as you can while they’re in season! Così bella—love love the focus on the Uffizi —one of my favorite places in this world to simply lose myself—and the connection to art, religious in particular, to the pomegranate —you know this retired art teacher would love such—and a recipe too boot—can’t get much better than that!!! Grazie cara! The Uffizi is wonderful, you could never get bored there. I’m a greedy (former) art historian so food and art and an obvious combination for me! I’m glad you enjoyed reading. Thank you! The Uffizi is such an inspiring place. I used to be an art historian (though not a Renaissance specialist) so it’s nice to write about art again sometimes. That sounds lovely, they’re such beautiful fruits aren’t they. Your pomegranates look so delicious and beautiful! Your first photo looks like a painting. So beautiful! Thanks! Pomegranates are such a beautiful shade, very photogenic. You should definitely try one if you get the chance, they’re delicious: sharp yet sweet. Thanks for the kind words and the useful link! This is such a wonderful post. The salad is a fantastic combination of ingredients and the colors so beautiful. Your photography, too, is quite stunning. I’m blushing. Thanks for the kind words and glad you liked the post. Pomegranates are so photogenic. After lunch today, as my wife was eating a pomegranate, I mentioned the art in your lovely post – my daughter immediately took up the story and told us all about Persephone and Demeter! Very informative post. I studies art while in college and saw, but never realized how often a pomegranate appears in Renaissance art. Funny how we can see things without really seeing until it’s pointed out. And your salad is a work of art itself. So lovely. I absolutely enjoyed this. That was really interesting! I love pomegranates, but had no idea of their distinguished artistic history!